Mention the phrase “auto accident” to the average person, and chances are that he or she will immediately think of collisions between vehicles. Bring up the concept of a single vehicle accident, and it will probably conjure up images of a car running into a building or off a cliff. Whatever the case, most people probably believe that the blame for single-vehicle accidents resides with the drivers of the vehicles, themselves. After all, where else could the blame lie? With the wall of the building? With the cliff? In actuality, many of the auto accident cases handled by the White Plains personal injury attorneys of Worby Groner Edelman LLP involve just one automobile. 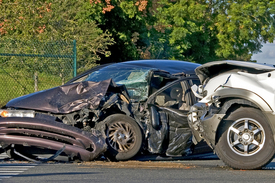 Indeed, our personal injury law firm handles the full range of auto accident cases, regardless of the causes or resulting injuries, and whether they involve one, two, or several vehicles. Our impressive record of jury awards and settlements in auto accident cases is a testament to our skills, knowledge, and perseverance. As experts in litigation arising from White Plains car accidents, our personal injury lawyers are eminently capable of bringing your case to a successful resolution. If you or a member of your family has been injured in a car, truck, SUV, motorcycle, or other motor vehicle accident, whether a single vehicle accident or a multiple vehicle accident, we encourage you to contact the law firm of Worby Groner Edelman, LLP, today for an evaluation of your case. Defective auto parts - If an accident is caused by a defective auto part or product, then a claim may be filed against the designer and/or manufacturer of that product. Commonly defective auto parts include brakes, steering columns, fuel lines, and tires. In cases of rollover accidents, roofs that are not sufficiently strong to protect the occupants of the vehicle may also be considered defective. Road defects - Many single vehicle accidents occur due to defects in the road, especially when drivers are not properly warned of such defects. Signage defects - Improper signage can lead to many otherwise preventable accidents. For example, if there is no road sign indicating an upcoming dangerous curve that requires the driver to slow down, there may be grounds for litigation. Rollover accidents - Particularly with older-model SUVs with high centers of gravity, auto designers and manufacturers may be held liable in cases involving rollover accidents. Whatever the type of motor vehicle accident you have been involved in, we urge you to contact our White Plains law firm for an evaluation of your auto accident case today.